We have become fans of Le Tour, the Tour de France. Staying a week longer in France this year, we are going to miss the first week on television and will have to try and catch up during the second two weeks when we are back home. ITV4 puts on some very fair coverage of this premier cycling event. 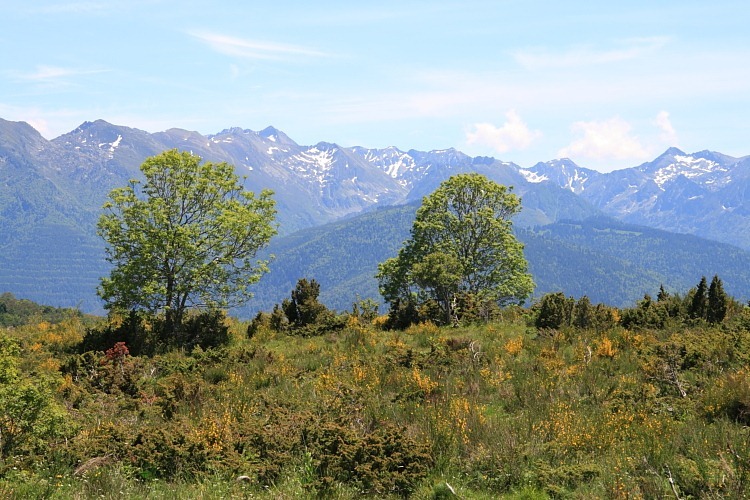 Anyone with a passing interest in Le Tour will know that two of the areas featuring in every year’s event are the mountain ranges of the Alps and the Pyrenees. Anyone having spent more than a passing moment in France will not only realize that cycling is a national obsession, but that the French really aren’t that happy cycling unless they are cycling uphill. Show Frenchman a col and he is apt to leap astride a bicycle and begin slogging his way up it. In our much long-for continued good weather, we popped about 50 miles down the road today into the Pyrenees. We’d taken lunch (some leftover paella) with us but couldn’t resist the look of a small bar/restaurant in one valley heading over a pass for Ax-les-Thermes. While we were enjoying a splendid, though too large, lunch for €8.50, in clopped a cyclist wearing cleated shoes – the kind that clip onto pedals like ski bindings. Clearly this was a cyclist who knew what he was doing. We were at about 1200 metres. To another interested French diner, he mentioned something about “doing the major cols”. Eventually we all finished our lunch and continued on our respective ways. We continued, with the help of a tireless internal combustion engine, up to the top of the pass, the Col du Chioula (1431 metres/~4400 feet). 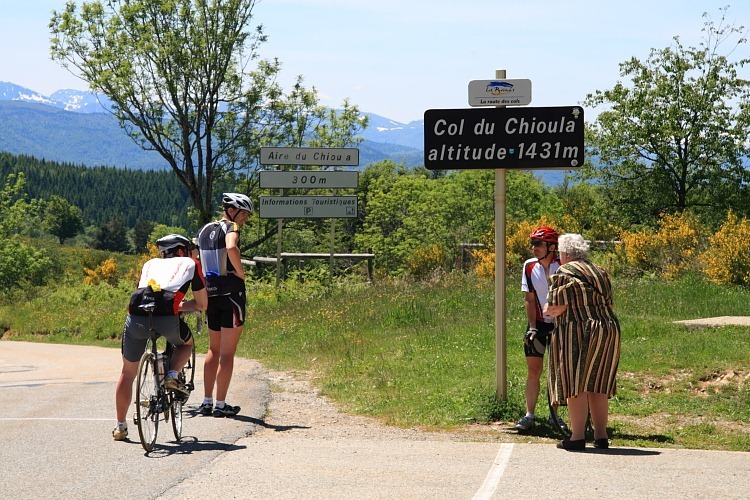 Not only were we greeted by some magnificent Pyrenean views, but we were also greeted by a group of three more cyclists having their engineless hill-climbing achievement recorded on pixels/film by a very interested lady of “advanced years”. Having taken their photo, she was quizzing the three riders about their journey. It seems as though the whole of France takes an interest in cycling. Having sated the curiosity of their appreciative audience, the three cyclists continued with the rewarding descent down into Ax-les-Thermes. Our farm site is atop a modest hill near Fanjeaux. I’ve foolishly cycled up it once and it hurts. I have nothing but admiration for those who can gleefully cycle up cols higher that any peek existing in the UK. Bravo!